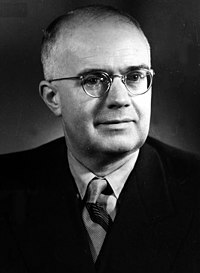 Oskar Ryszard Lange (27 Juli 1904 – 2 Oktober 1965) adalah ekonom dan diplomat Polandia. Dia paling dikenal atas anjurannya untuk penggunaan alat harga pasar dalam sistem sosialis menyediakan model sosialisme pasar. Selama dia menetap di Amerika Serikat, Lange adalah seorang guru akademis dan peneliti yang dicari dalam bidang ekonomi matematika. Setelah di Polandia komunis, dia adalah anggota Komite Sentral Partai Pekerja Bersatu Polandia dan seorang yang percaya pada manajemen ekonomi tersentralisasi. 1934. "The Determinateness of the Utility Function," RES. 1935. "Marxian Economics and Modern Economic Theory," Review of Economic Studies, 2(3), pp. 189–201. 1936b. "On the Economic Theory of Socialism, Part One," Review of Economic Studies, 4(1), pp. 53–71. 1937. "On the Economic Theory of Socialism, Part Two," Review of Economic Studies, 4(2), pp. 123–142. 1938. On the Economic Theory of Socialism, (with Fred M. Taylor), Benjamin E. Lippincott, editor. University of Minnesota Press, 1938. 1942. "The Stability of Economic Equilibrium", Econometrica. 1942. "Say's Law: A Restatement and Criticism", in Lange et al., editors, Studies in Mathematical Economics. 1944. Price Flexibility and Employment. 1944. "The Rate of Interest and the Optimal Propensity to Consume", in Haberler, editor, Readings in Business Cycle Theory. 1945a. "Marxian Economic in the Soviet Union," American Economic Review, 35( 1), pp. 127–133. 1945b. "The Scope and Method of Economics", RES. 1953. "The Economic Laws of Socialist Society in Light of Joseph Stalin's Last Work", Nauka Paulska, No. 1, Warsaw (trans ., 1954, International Economic Papers, No. 4, pp. 145–ff. Macmillan. 1959. "The Political Economy of Socialism," Science & Society, 23(1) pp. 1–15. 1961. Economic and Social Essays, 1930–1960. 1963. Economic Development, Planning and Economic Cooperation. 1963. Essays on Economic Planning. 1964. Optimal Decisions: principles of programming. 1965. Problems of Political Economy of Socialism, Peoples Publishing House. 1965. ' 'Wholes and Parts: A General Theory of System Behavior, Pergamon Press. 1965. "The Computer and the Market", 1967, in Feinstein, editor, Socialism, Capitalism and Economic Growth. 1970. Introduction to Economic Cybernetics, Pergamon Press. Review extract. ^ J. Tinbergen, 1991. "Solving the Most Urgent Problems First", in Michael Szenberg (ed.) 1993, Eminent Economists: Their Life Philosophies, Cambridge University Press, p. 279 (cambridge.org). ^ Thadeusz Kowalik,  2008. "Lange, Oskar Ryszard (1904–1965)", The New Palgrave Dictionary of Economics, 2nd Edition. Abstract. ^ Witold Gadomski, Rynek trzyma smycz [Gadomski o książce Belki] (The market holds the leash [Gadomski about Belka's book]). 11 June 2016. Rynek trzyma smycz. wyborcza.pl. Retrieved 26 June 2016. Milton Friedman, 1946. "Lange on Price Flexibility and Employment: A Methodological Criticism", American Economic Review, 36(4), pp. 613– 631. Reprinted in Friedman, 1953, Essays in Positive Economics, pp. 277–300. Charles Sadler, 1977. "Pro-Soviet Polish-Americans: Oskar Lange and Russia's Friends in the Polonia, 1941–1945", Polish Review, 22(4), pp. 25–39. Oskar Lange in Encyclopædia Britannica. Oskar Ryszard Lange (1904–1965). The Concise Encyclopedia of Economics. Library of Economics and Liberty (edisi ke-2nd). Liberty Fund. 2008. Oskar Ryszard Lange, 1904-1965. In the History of Economic Thought by the Institute for New Economic Thinking. Halaman ini terakhir diubah pada 20 Oktober 2017, pukul 23.54.